I originally posted about adding a user as a local administrator with the command linehere. Since then I have realised that this only applies to Windows Server 2008 Small Business Server. 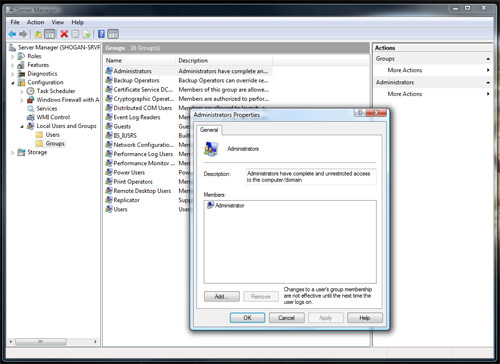 Windows 2008 Standard still uses the old GUI method of adding a user as local admin that is found in Windows XP, or 2003 for example. This can be done by opening the Computer management console, (right-click Computer) and then select “Manage”. Expand Local Users and Groups, and then click on Groups. Double click Administrators, click Add, then type the user name in the window that opens and then click Ok. (Check name if you are not sure of the user’s entire username). That will add the user to the local administrators group the easy way (GUI) and save you the trouble of using the command line instead. See the screenshot below for what you are looking for. 978 days, 4 hrs and 23 min.